Sydney Arrison began writing at a very early age. While a freshman in college, her English professor encouraged her to pursue writing as a career. She was a reporter for the independent press and is currently working on her third novel. Sydney resides in New York with her husband and two children. As a writer, what has been your biggest challenge, trials or tribulations that you have overcome? Often times it's very difficult to visit the fictional world, because real life is knocking on the door. While working on my latest book "My Heart In Seoul," my best friend was gravely ill. She and I knew she didn't have that much time left. Although my heart was broken and my spirit shattered, I knew if I stopped working on the book I wouldn't have finished it. Being able to visit Jasmine's and Wen's world is what kept me afloat. I couldn't wait to find out where the story was going next. Writing was definitely a welcome escape from reality. I think some of us do our best writing when we are "going through something." Could you please give us a blur about your present or upcoming book? The book is about news anchor Jasmine Sinclair. She lives in NY, and has a very public break up with her famous fiancée. Instead of reporting the news, Jasmine has the tables turned on her and she has now become the news. Fed up with the prying eyes of the paparazzi, she decides to accompany her father, Senator John Avery Sinclair on his trip to Seoul. 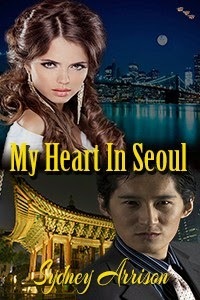 Intoxicated by the night life in Seoul, Jasmine dares to approach a mysterious and handsome stranger. The encounter leads to an unforgettable, passion filled weekend, but upon returning to New York Jasmine soon realizes; that nothing will quell her yearning to be with the man she loves. Will distance, ambitions and family-ties keep them apart or will they find each other again? Are you planning to write any more books in the near future? Right now I’m working on a young adult mystery novel. The story takes place in the south in the 1950’s. What advice would you give someone who is thinking about writing a book? I would tell them not to write for fame or fortune. Write because you have a story to tell, a story to share. I would also tell them to be patient. How can our readers get in touch with you? I have a contact form on my blog. Sydneyarrison.blogspot.com. Readers are more than welcome to email me. Thank you for allowing us to dialogue with you. Do you have any words of wisdom for future authors? I would tell them to write from the heart, to not write based on trends. Thank you for the interview. For some reason I had December 16, as the day the interview would be posted.